Redtail Botia is a type of freshwater fish that comes from the Botiidae family. This fish variety hails from large rivers in Laos, Thailand, Vietnam and Cambodia. Other widespread names for this fish variety are Blue Botia, Red-finned Loach and Colored Botia. Generally, these fish breeds prefer the water environment with the temperature ranging from 72 Degree Fahrenheit to 86 Degree Fahrenheit. The Redtail Botia fish variety has a long, solid body and it has a curved back like several other varieties of the Botiidae family, including yoyo and clown loaches. Wild Redtail Botia fish varieties attain a maximum body length of 10 inches, whereas the fish in captivity attain a body length, ranging from 6 inches to 7 inches. They have a bluish-gray colored body and the fins appear in orange or red color and in rare situations, they appear with yellow color. 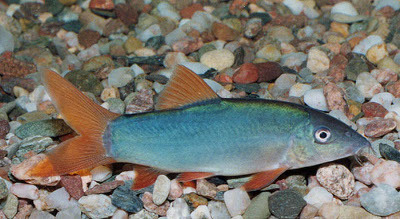 Sometimes, immature fish appear with a green shaded body, but a bright-colored body indicates that the fish is healthy. Young Redtail Botia fish are energetic schooling fish. They spend most of their time in hiding under rocks or in caves in privacy when they grow older. Similar to several loaches, this fish variety is nocturnal that comes out during the nighttime to excavate through the gravel and search for food. Similar to clown loaches, these fish varieties occasionally make a loud clicking sound. Redtail Botia fish varieties are omnivorous, but they feed on a meat-concentrated diet of bloodworms, krill, earthworms, Daphnia and live insects. The Redtail Botia breed is a semi-violent fish that takes pleasure in the group of its own varieties, or other semi-violent fish varieties. The fish will school with others of the equal size and age. This type of fish appreciates holes, caves, and other sites to hide, particularly when it sleeps. They are as well a normal killer of snails, and will assist in their control in the aquarium. The average lifespan of the Redtail Botia fish breed is 5 years to 8 years.